A “first look” trailer for Chris Buck and Jennifer Lee’s Frozen is online. While the 53rd Disney animated feature is loosely based on Hans Christian Andersen’s The Snow Queen, this has no discernable connection to the tale, playing a bit like a Scrat short about a snowman (which, in turn, played sort of like a Looney Tunes cartoon). Still, it’s fun, and the animation is lovely. The full film stars Kristen Bell as “Anna,” the lead, and Idina Menzel as the Snow Queen. It hits theaters this Thanksgiving (or that weekend, anyway), on November 27, 2013. Disney’s next non-Pixar CG-animated feature centers around an analog for Donkey Kong — the titular Wreck-It Ralph (voiced by John C. Reilly) attempts to shed his bad-guy image by escaping into Hero’s Duty (Halo), but inadvertently wreaks havoc in the video-game universe by freeing a digital villain (sort of like Tron?) — and it’s all mixed in with Who Framed Roger Rabbit?-style cameos from popular video game characters. So yeah. I had a grin on my face throughout the trailer. Jane Lynch as the tough-as-nails hottie from Hero’s Duty and Sarah Silverman as an obnoxious little girl (princess?) from some kind of Candyland-lookin’ world are inspired bits of casting, and the film looks great. This one’s a must-see for me. Wreck-It Ralph was directed by Rich Moore (long-time TV animation veteran and sequence director for The Simpsons Movie) and opens on November 2, 2012. Directed by Byron Howard and Nathan Greno. Starring Mandy Moore, Zachary Levi, Donna Murphy, Ron Perlman, M.C. Gainey, Jeffrey Tambor, and Brad Garrett. It’s more than just setting, though: Tangled‘s songs are â€” for the first time sinceÂ The Little Mermaid and Beauty & the Beast â€” truly good, not just serviceable. Composer Alan Menken has found a fantastic new collaborator in lyricist Glenn Slater; none of Menken’s Disney efforts since the death of Howard Ashman quite recaptured that same Disney magic like Slater and Menken do in Tangled. 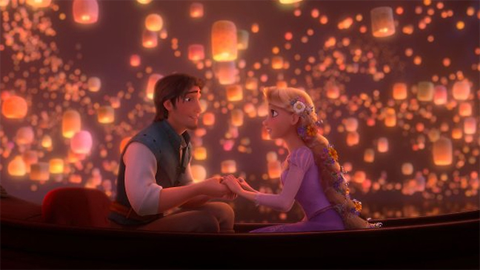 The leads â€” Mandy Moore’s Rapunzel and Zachary Levi’s Flynn Rider â€” are endearing and memorable, and yet very much in the classic Disney mold.Â Moore (who impressed me in bothÂ Saved! andÂ Dedication) is utterly irresistible as Rapunzel, played as an infectiously excitable almost-18 year old girl who seems very much like the classic Disney princessâ€¦ hopped up on Red Bull. If she comes off a bit extreme, it’s only appropriate: where Ariel and Belle were girls confined by their parents or their “small provincial town” their whole lives, Rapunzel grew up inÂ one buildingÂ for as long as she can remember. I groaned (while smiling) at a couple of silly jokes, but the film simply never hits a false note. The handful of brief action sequences are tremendously fun, the pacing is fast and smooth, and it tugs at the heartstrings a couple of times â€” perhaps not so forcefully as either Toy Story 3 or How to Train Your Dragon did earlier this year, but with no less skill. Despite its middling performance at the box office, this Rapunzel will soon secure her place in Disney’s princess pantheon â€” and it will be well-deserved. See it while you still can, or keep your eye out for the DVD. I didn't mention it in my review, but the animation is gorgeous,Â and the 3D is very well-used. 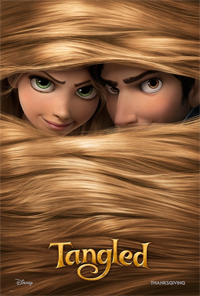 Tangled is rated PG for “brief, mild violence,” apparently. I wouldn’t have guessed it, myself. It’s a totally kid-friendly flick.